The universe is full of magical things patiently waiting for our wits to grow sharper.--Eden Philpotts. This is a picture of an ionic compound. 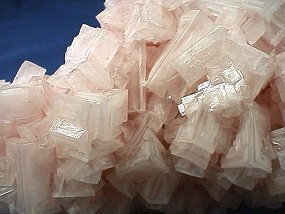 Since it is found in nature it has a mineral name: halite. First correct formula and GFW e-mailed to Mr. K at school earns 50 extra credit points. 19 Solution strength: Molarity, Normality, Molality. 20 Introduction to Organic Chemistry. Organic chemistry I: counting, alkanes, branched alkanes, isomers, cycloalkanes, alkenes. Organic chemistry II: aromatic hydrocarbons, alcohols, phenols. Test 21.3: Naming and diagrams: alkanes through alcohols. Chain, chain, chain of carbons: Mini-Lab. 22 Acidification of alcohol, Carboxylic acids. Acids, Bases & disassociation of water. Arrhenius Acids, Bronsted-Lowry Acids. Test 25.3 pH, pOH, acids and bases. Test 27.1: Ka & Kb.